YouTube user tvdxrools . has posted a short video showing what solar activity noise from the sun looks like on the waterfall at 31 MHz. He used an RTL-SDR dongle and 1/2 wave vertical antenna. A few weeks back we posted about some slides from the Defcon conference by information security researcher Melissa Elliot which detailed how she used an RTL-SDR to explore the world of unintended radio emissions. I did the capacitor mod and it makes a HUGE difference, and there is a bonus. Not only do you get an excellent, very low noise sound card, but the drivers include a “what u hear” mixer that works find on Windows 7 so you don’t need to buy a separate virtual audio cable. The unmodified Soundblaster X-Fi had somewhat fewer noise spikes showing up across the spectrum on SDR# than my internal soundcard. However when I did the capacitor mod, they decreased by a drastic amount. Before I realized the extent of the original internal noise spikes, I wasted time trying to “decode” them – worked about as well as my attempts to communicate with aliens via my dental work. So now my SDR# display looks really clean and most everything that looks like a signal is a signal. I don’t have before and after pictures, but the ones in the pdf file look like mine. BTW the capacitor values are probably not all that critical. I used a couple I had laying around – a 1000 uF 16v and a 120 uF 16v. Anyone with some soldering experience and a reasonably small tip can do the mod but it’s a little tricky to position the caps and have the case close properly. The unwary might get polarity confused – the tantalum caps on the board are marked on the positive end and the electrolytics you add are marked on the negative end. The capacitor mod essentially involves soldering in two more capacitors onto the soundcard PCB. 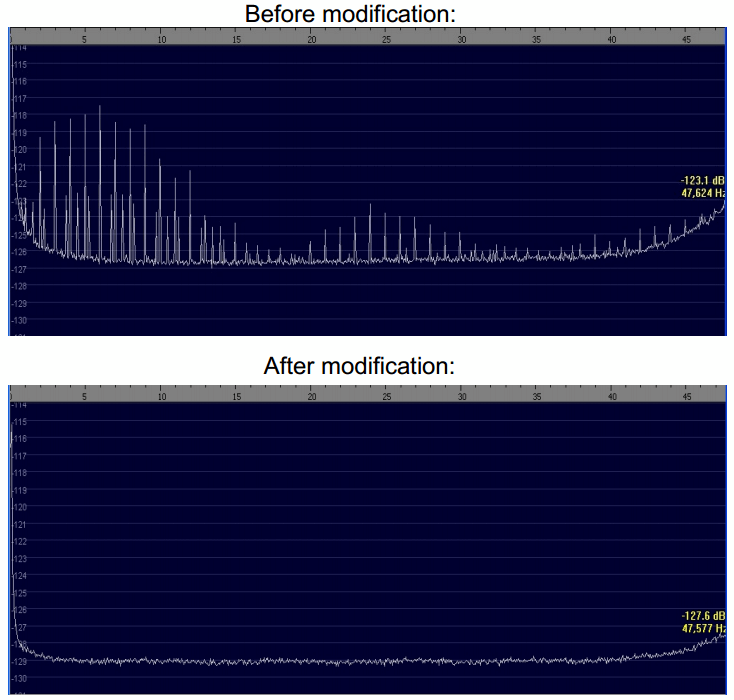 The improvement is more useful for soundcard based SDRs such as the SoftRock, however, in Toms case he found that the capacitor mod also improved his RTL-SDR reception by removing numerous unwanted noise spurs he was seeing. Since the RTL-SDR is not a soundcard based SDR, in Toms case the external soundcard was probably causing strong interference that the RTL-SDR was picking up, and the capacitor mod treated the noise source. The mod may also help by giving you a cleaner audio signal, which may help when decoding digital signals. The Ham-It-Up upconverter uses a 5V USB power input. I discovered that different 5v power sources can cause significant interference with this upconverter, and the same effect will probably occur in other upconverters as well. When the upconverter was powered by mains power via a phone charger, the signals were almost completely drowned out in noise. Powering it with a PC USB port was better, but the PC USB power introduced some other strong noise sources. Powering it with a battery (used a mobile phone with OTG cable) was the best option. There are still some strong noise sources present, but I can probably solve them with better shielding. Click continue reading to see some comparison images. Many people have noticed that even if there is not an antenna connected to the RTL SDR FM Stations still come strong. This is not good at all because these are signals that are getting into the PCB via another way that is not the antenna. He then goes on to explain a method he used to significantly reduce the interference, which involves removing the male USB connector from the dongle PCB, and fitting your own USB cable leaving the shield floating, which he then wraps with aluminium foil. Check out the rest of his post here. YouTube user VoiceOfShortWave has posted a video of his rtl-sdr dongle receiving HF LSB ham radio transmissions at 3.7MHz with excellent performance. He used a homemade VEE antenna, and also a Butterworth filter to help reduce FM band interference. His other video shows the effect of his butterworth filter with 60MHz cutoff turning on.